Tattoo Questions and Answers - What you need to know! A few days after the tattoo is completed, the skin around the tattoo starts to peel, similar to sunburn. Picking at the skin should be avoided, because doing so can damage the artwork and increase the risk of infection. 7 to 10 days after getting a tattoo, the peeling process should be completed, leaving the skin shiny, and slightly wrinkled. After two weeks, the tattoo should appear fully healed. Although you can get a tattoo any time of the year, your skin gets a lot more abuse during the summer with swimming, tanning and just being exposed to the elements more. Wintertime is really the best season to get a tattoo. Yes, the area may need to be shaved by the artist as part of the preparation for your tattoo, but it should grow back normally as your tattoo heals. You should see no change in the hair color or density when it returns. HOW LONG SHOULD I WAIT TO GO SWIMMING AFTER A NEW TATTOO? Until the tattoo is fully healed, the area is vulnerable to the bacteria found in swimming pools and lakes. Waiting a minimum of three weeks to go swimming reduces the risk of irritation and infection, but if the tattoo has not completely healed, it is necessary to clean the area thoroughly after swimming. DOES IT COST MORE FOR COLOR? Color is not more or less. This also depends on the size and the detail of the tattoo. Small tattoos with 2 or less colors would be similar to one that only has gray shading. When doing multiple colors, the cost would be more because of the time that it takes. HOW LONG BEFORE I CAN SHAVE THE TATTOOED AREA AGAIN? As part of the preparation for your tattoo, the area may be shaved clean. After a few days, the hair will start to grow back normally but it is important that you not shave the area again until your tattoo is full healed – no matter how itchy the growing hair might be. When shaving a healing tattoo, you run the risk of damaging your artwork and causing painful scars if you cut raised skin or accidentally snag and remove scabs that are still healing. Chemical hair removers are just as bad (if not worse) – in addition to potentially damaging your artwork, chemical hair removers can cause painful chemical burns and rashes when applied to broken skin. Wait until you can carefully run your fingertips over the tattooed area and not feel any peeling, scabbing, or swelling. When you can’t tell that you’re touching your tattoo with your eyes closed, you should be good to go (usually 2-3 weeks). The cost varies on the size of your tattoo, the complexity, and where you put it on your body. Our prices start at $50.00 and go up from there. 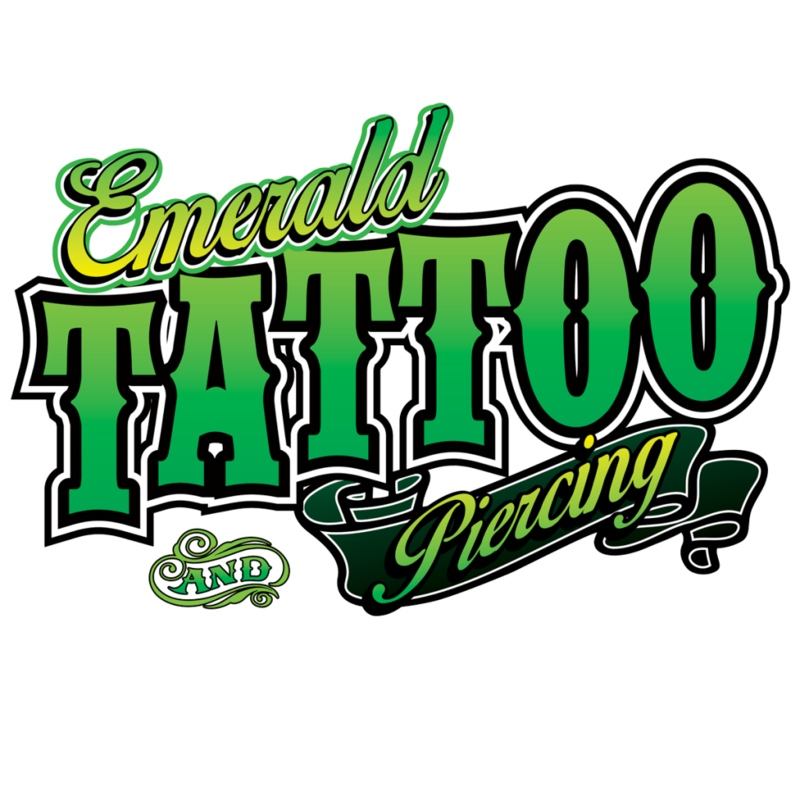 Emerald Tattoo freely admits WE ARE NOT THE CHEAPEST! Remember, you get what you pay for and only have one chance to get one tattoo on that one spot on your body. Do it right! Go to a pro! There are many different factors that can cause fading. The most common is prolonged periods of direct sun light. Others are shades of ink used, the quality of pigment and quality of tattoo work. There are many factors that can cause your tattoo to fade; these are just a few of the main causes. Lighter colors tend to fade first. Make sure you are well rested, well hydrated, and have eaten recently. Aside from that, take a shower, charge your phone or tablet up to full, and don’t bring in your 50 closest friends (1-2 are fine). You must be at least 18 years old with a valid ID to get tattooed here. We do not tattoo minors, even with parental consent. CAN YOU GIVE BLOOD IF YOU HAVE A TATTOO? People who have tattoos can give blood in many situations. Some states, such as Georgia and New York, do not oversee tattoo businesses as of 2014, and blood donors in those states must wait 12 months after the tattoo is inked due to hepatitis concerns. Just like a restaurant, if you are happy with the tattoo service you received, you should tip your artist. WHAT SHOULD I PUT ON A NEW TATTOO? After you remove the bandage, wash your new tattoo with lukewarm water and a mild liquid soap. An antibacterial or antimicrobial soap, such as Satin or Provon, is preferred. Use your hand, rather than a washcloth or anything abrasive, to gently remove the slippery plasma to prevent scabbing. After patting dry, use an A and D vitamin-enriched ointment or an antibacterial ointment, such as Bacitracin. Don’t use Neosporin on a new tattoo, because an allergic reaction can result in small red spots on the skin, which can damage your ink. If you use a lotion to help keep the tattooed skin soft, use one that is free of dyes and fragrances. Eucerin and Lubriderm are two popular options. Specialty tattoo after-care products, such as Recovery, are alternative to over-the-counter lotions and ointments. You are more than welcome to bring in your own design or pick one of our hundreds of thousands of designs that line our walls. If you already know what you want, great, it is very simple to convey your idea to our artists. The easiest way is with a picture. It doesn’t matter what the picture is on (keychain, t-shirt, book, drawing…etc.). Even if you can’t draw, our guys still love to do the custom work. Just describe it well or even bring in a stick drawing. We can turn it into your dream tattoo on paper right before your eyes! DO YOU USE SINGLE USE NEEDLES? The needles are new, sterile, and single use, placed into sharps container for proper disposal!! Everything that is disposable is one time use, and non-disposable items are cleaned and sterilized in an autoclave. The autoclave is regularly tested for effectiveness by doing a spore test every month. We record all results from spore tests in a book at the shop. Autoclave is tested at every use with sterilization integrators, and logged into a folder with the date and cycle number of each process. IS IT SAFE TO USE PAIN KILLERS DURING MY SESSION? The answer to this question is probably one of the more discussed issues in the tattoo field. For the most part, the short answer is “yes” – but with some qualifications. First, know that we cannot offer you any type of medication or medical advice at any point during your visit. Some types of painkillers can thin the blood and cause excess bleeding during your session. Over the counter drugs such as asprin, naproxen, and ibuprofen are processed by the kidneys, and are more prone to this problem than alternatives like Tylenol (acetaminophen) which is handled by the liver. Even so, we don’t typically have any issue with people using ibuprofen during their sessions. Excess bleeding can affect how well the ink is held by the skin, washing it away as quickly as it is applied. In addition, excess bleeding is simply messy and can slow down progress due to constant wiping to keep the work area clear. Do not take any type of painkiller that impairs your judgment in any way before your session. We cannot (and will not) tattoo someone who appears to be under the influence of any medication that is affecting their ability to make sound decisions (this includes alcohol). WILL I NEED TO TAKE TIME OFF TO RECOVER FROM A TATTOO? Not for most jobs. The area will be tender for about a week, (similar to sunburn or minor abrasion) and the swelling can cause discomfort, but for the great majority of people this is only a bit bothersome and does not interfere with their work. If your work might expose the healing tattoo to unsafe conditions, or the work is on an area that will hurt to bend or flex as part of your job, then you might want to schedule near a weekend or take an extra day off to recover.